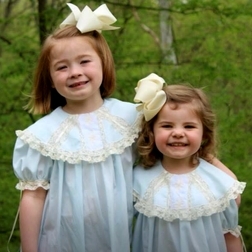 A lovely lace float style heirloom dress with round collar perfect for flower girls, portraits, First Communion, confirmations, baptisms and holidays. 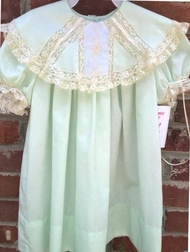 The dress is made with your choice of color batiste fabric and has a beautiful round collar trimmed in French lace. 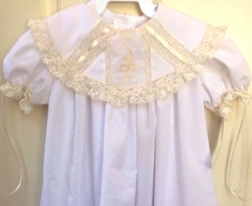 The lace is also placed in two vertical rows with beading and satin ribbon in the middle. The center panel of the collar is made with a delicate, hand embroidered Swiss insert with gorgeous connected bows in either ecru or white. 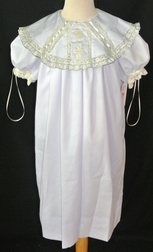 The sleeves are embellished with lace and ribbon woven through beading. Because heirloom batiste fabric is thinner than broadcloth, it is recommended that a slip be worn under the dress.